Here’s your chance to experience a unique 3 bedroom, 2 bath Orcutt home that has been remodeled practically top to bottom! Click here to see the virtual tour, and then be sure you see it today from 1:00 to 3:00 — 3901 Terrace Avenue — turn west onto Terrace off of Bradley Road, near the Santa Maria Way/Bradley intersection. Gorgeous kitchen! Price just adjusted to only $385,000! For more information, give me a call at (805)937-5777 or complete the easy Contact form below! Price Reduced on Sharp Orcutt Home! Serious homeowners, serious about selling! Today, this unique Orcutt home is even more of a bargain than before, as the price has dropped from $395,000 to $385,000! Re-designed just a few years ago to reduce water consumption, the back yard living space is “hard-scaped”, meaning the only lawn requiring water in our current drought is the front lawn. In the back, you can enjoy a fire pit, the picnic table and benches, the cool playhouse (or storage) and the upper terrace where your green thumb can shine! Fruit trees include apple, apricot, plum and pomegranate, but you can easily add a great vegetable garden too! Inside, enjoy the gorgeous stained concrete flooring throughout the home — just perfect for anyone with allergies, or perhaps someone using a wheelchair — and who wouldn’t love the beautiful kitchen! Newer roof, too! I introduced this home last week, so just click here to go to that post, review the details, and watch the virtual tour — then call me for an appointment to see it before it’s gone! I’m easily reached at (805)937-5777 or use the Contact form below, and I’ll get right back to you! Thanks! Last week was better with new inventory, but what happened to closings? 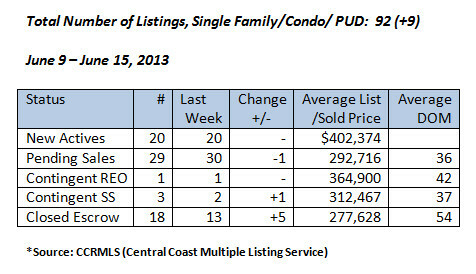 The closings reflect sales of 30-60 days ago, as far back as March and as recent as April. Maybe we will see a surge next week, but it must have been pretty quiet around the title companies last week… This week, I have added a new category of sales that will help in understanding total contract sales. Because we have returned to a “normal” market, and prices have gone up, more homeowners have the equity to attempt a “move-up” again. They still need to sell first before buying, but since they are now able to do so, sellers are starting to accept offers that contain that contingency. 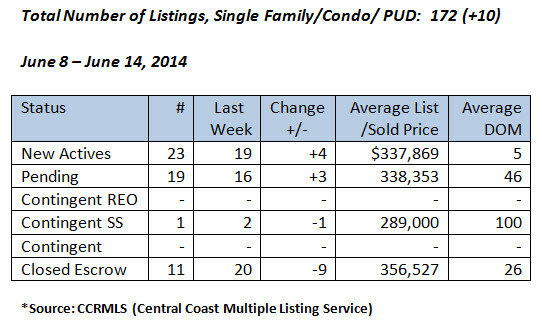 This past week there were 2 sellers who accepted offers based on the sale of the buyers’ homes. One is a Foxenwood Estates home listed at $549,000 and the other is a condo in Santa Maria, priced at $172,000. I think we will be seeing more of these as we roll into the summer months, so I’m adding this category for accuracy, with regard to the actual number of sales. It’s so great to look back at a year ago and see that our inventory has doubled! So much healthier, all the way around. 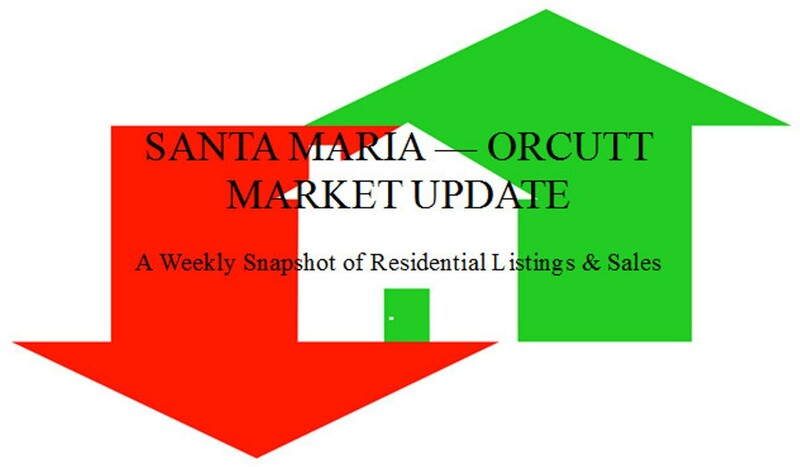 For more information about the local Santa Maria Valley real estate market, or to start shopping for your next home, please give me a call at (805)937-5777 or complete the Contact form below. As always, your comments are welcome too, and there’s a space for them just below the Contact form! Unique & Delicious New Listing in Orcutt! I had to say that: delicious! It really is a one-of-a-kind 3+2 in Orcutt, because the owners have put so much personality into it that it is hard not to love! First, it’s perfect for anyone suffering from allergies, as there is absolutely no carpet in this home! Yet far from being bored with the standard 18″ tile so common these days, these floors are tastefully stained concrete. Talk about easy to care for, especially if your household includes kids and/or pets! How about someone using a wheelchair? Piece of cake! Enjoy the video, then continue reading! What about entertaining? The owners removed some inhibiting walls, vaulted the ceilings in the living areas, and voila! What was once a boxy, cumbersome space is now wide open and ready for the next party! Guests flow easily between the kitchen, great room and back yard, and the hosts get to enjoy everything too, even while cooking in the (ta-da) gorgeous remodeled kitchen! Dark cabinets, gleaming stainless steel appliances and stained concrete counters complete this Pottery Barn-style kitchen. When not entertaining, the long counter/bar is the ideal spot for the kids to use for doing their homework while mom and dad prepare dinner. For the conservationist in you, or okay, maybe the lazy side of you, the entire back yard has been hard-scaped so all you need to do is water the plants you’ve potted, and the fruit trees (apricot, plum, apple and pomegranate)! Of course if you love to garden, and prefer to grow your own veggies, there is a perfect space that runs the width of the property on the terraced portion of the yard! Otherwise, you can just enjoy your weekends around the firepit and picnic table! The two side yards are wide, and one is currently used as a dog run. The list of improvements to the house goes on and on, so you’ll want to give me a call to come see this chic single level home in the Orcutt School District. Discover for yourself! Key facts: not too big, not too small, kitchen and baths stylishly remodeled, newer roof, windows replaced throughout, and absolutely easy care!! Come see this little oasis before it’s gone! Give me a call at (805)937-5777 or complete the Contact form below. Let the adventure begin!